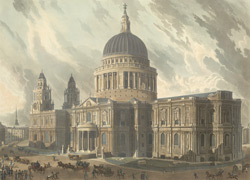 Christopher Wren's design was the fifth cathedral to be built on the site. The construction took almost four decades - from 1675 to 1709. To avoid being forced to scale down his plans, Wren insisted on starting work on the complete ground plan for the whole building. The most visible feature is the magnificent dome chosen instead of the more usual cathedral spire. This controversial building dominated the city landscape. Daniel Defoe believed that the cathedral was criticized on account of its "Protestant plainness and its situation - which would have been improved if Wren had been allowed the space to create a circular piazza around it." Instead it was adjacent to a busy thoroughfare, as shown in the picture.